The Funding Equity Working Group has been meeting since the end of January to formulate recommendations to the Board of Neighborhood Commissioners about Neighborhood Council funding. The Group had an excellent meeting on Monday, April 23rd at the CD 9 Constituent Service Center. Thank you to the Office of City Councilmember Price for hosting the meeting. Thank you also to the Office of the City Clerk for their participation. There was a robust discussion on a number of funding-related topics. The group also analyzed various Neighborhood Council funding concept proposals, including a presentation on proposed base funding with an augmentation based on census population. 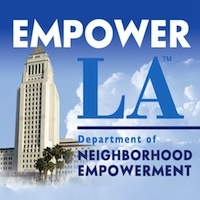 The Equity Group voted to support a proposal including four funding concepts from Tony Wilkinson and a proposal from Brad Kane (http://empowerla.org/wp-content/uploads/2018/04/BONC-NCFEWG-Proposed-Recommendations-Vice-Chair-04.23.18.pdf). The remaining funding equity proposals submitted by other group members will be evaluated at the next meeting. After a total of seven meetings thus far, there will be one more Funding Equity Work Group meeting on Thursday, May 17th. That meeting begins at 6:30 pm and will take place in the John Ferraro City Council Chambers at LA City Hall (3rd floor, Room 350). Thank you to the boardmembers and stakeholders of various Neighborhood Councils for your participation in the Neighborhood Council Funding Equity Work Group! After extensive discussion, the Neighborhood Council Funding Equity Work Group has generated four distinct proposals for methods to more equitably distribute funds to Neighborhood Councils in the City of Los Angeles, with consideration for their size. The four proposals all reduce funding for the smallest Neighborhood Councils and increase funding for the largest Neighborhood Councils. They are described below in very general terms. The four proposals are listed in the order of impact that they have on the distribution of funding (from less impact to greater impact on individual Neighborhood Councils). (1) Leave funding for most Neighborhood Councils unchanged, at a fixed amount (currently$42,000 per year). Remove funding from the smallest councils and move those funds to the largest councils. (2) Give all Neighborhood Councils base funding of $32,000 per year (about 3/4 of current total funding). Distribute the remaining amount of current funding (plus any increased funding from the City) to Neighborhood Councils based on their share of the total resident population. Assure that every council receives at least $37,000 total funding. (3) Base funding of $25,000 per year for each Neighborhood Council. Distribute the remaining amount based on the share of resident population. No guaranty of minimum total funding. (4) Base funding of 50 percent of the City’s total funding for all Neighborhood Councils. (With the current funding of $4,074,000 for 97 Neighborhood Councils, that would be $21,000.) Distribute the remaining amount based on the share of resident population. No guaranty of minimum total funding. The Neighborhood Council Funding Equity Work Group received requests from both the Board of Neighborhood Commissioners and from the Health, Education and Neighborhood Councils Committee of the City Council to provide several options for their consideration, rather than a single proposal. This proposal is a motion to adopt all four options that are described above as the final work product of the Committee, and to move those options forward to the Board of Neighborhood Commissioners as our recommended alternatives. Optionally, the Committee could amend this proposal to eliminate one or more of the alternative methods, or to otherwise modify the final proposal of the Committee.